It’s time to put president books for kids on hold at the library. Next month the United States celebrates President’s Day and clever, entertaining picture book biographies are a great way to introduce the politicians who have helped shape our country. The thing is… a lot of presidential biographies are, well…. to be blunt… super boring. Little known fact about me: I minored in history in college. I love history, yet until recently I found American history to be extraordinarily dull. Why? Because all my grade school reading material was designed to turn the “founding fathers” into untarnished heroes. Master George’s People: George Washington, His Slaves, and His Revolutionary Transformation. I really love this book. It is the single most interesting children’s book I have every read about George Washington. If I had read this book as a kid, I think my opinion of American history would have been vastly different. It’s geared towards upper elementary through middle school, but older teens and even adults will find it fascinating. Without either demonizing or over-praising our first president, the book looks at Washington’s relationship to slave ownership. There is a lot of personal information about his specific slaves, how his treated them throughout his life and what led him to free all his own slaves in his will (something Jefferson, for all his talk about the evils of slavery, did not do). UPDATE: one of my readers alerted me to this critical review of Master George’s People. I think they make an excellent argument, and as someone who wants to learn more about how to be a discerning reader and a better citizen, I encourage you to read it, too. John, Paul, George & Ben. Yes, I do realize that John and Paul were never president. This book is best appreciated by kids who already know their history, and also by adults. I always appreciate a children’s book with jokes adults will find humorous. The book takes a couple of well-known characteristics about the men (Hancock’s signature, Washington and the cherry tree, etc.) and turn them into a witty joke. Notes at the end of the book separate fact from fiction. Thomas Jefferson: Life, Liberty and the Pursuit of Everything. I like Kaiman’s balanced look at Jefferson. She discusses his intellectual life, friendships with the other “Founding Fathers”, as well as contradictions such as the disconnect between his views on slavery and his actual practices. Kaiman’s whimsical, colorful illustrations take the reader on a fun ride through Jefferson’s life that, unlike many picture book presidential biographies is not overwritten. Thomas Jefferson Builds a Library celebrates Jefferson’s intense love of books. With a great deal of charm, it traces his life as it relates to books and his love of reading, from his origins and a book-loving kids to a father who insisted his kids read, to the writing of the Declaration of Independence, his Presidency and the founding of the Library of Congress. This is a lively discussion and portrait and includes an author’s note with more detailed information. Dangerous Crossing: The Revolutionary Voyage of John Quincy Adams tells the story of how, in 1778, John Adams took his son on a secret mission to France. I found this to be a fascinating and engaging tale about an event I knew nothing about. Vivid and detailed text describes the hardships as well as excitement of the voyage and the atmospheric illustrations add to the experience. Dolley Madison Saves George Washington is a nice change from the usual presidential biography. Life in politics is not all about making laws and fighting with Congress. Dolley was a popular first lady, whom many underestimated and wrote off as a “socialite.” It was Dolley, however, who stepped up to the plate as the soldiers fled the White House during the War of 1812 and rescued valuable state papers from the mansion, as well as the now-famous portrait of the first Commander-in-Chief. Great fun but also a serious look at the importance of courage. Abe Lincoln’s Dream. I’m a big fan of Lane Smith’s illustrations, although I sometimes think as an author he doesn’t quite hit the mark. However, I really enjoyed his unique take on Lincoln’s story. A young African-American girl meets Lincoln’s ghost on a White House tour. The two of them go flying across the country and share their dreams, both large and small, while also telling jokes. Quincy (the girl) fills Abe in on some of the progress the country has made, while also suggesting more progress is necessary. A lovely, funny optimistic book. Teedie: The Story of Young Teddy Roosevelt tells the story of Teddy as frail but intelligent boy who relied on his strong mind to overcome the shortcomings of his health (he was asthmatic and didn’t even know how nearsighted he was until the age of 13!). The focus is on Teddy’s youth, but the book covers his rise as a child of one of New York’s wealthiest families (I dislike when books gloss over the privileged background of many of the country’s leaders; thankfully this book did not do that.) all the way through to his becoming a leading political figure and eventually the president. The book became slightly less interesting after Teddy grew up, but still, it made the list due to Don Brown’s wonderful illustrations. The Camping Trip that Changed America. After reading a book by naturalist John Muir, Theodore Roosevelt sought out the man to show him the wilderness. The two men went on a solo camping trip in Yosemite Valley (a gorgeous place I highly recommend visiting) and Muir regaled Roosevelt with stories of his experience as well as discussing the importance of protecting the land from development. The result of the trip was that Roosevelt went back to Washington and started a campaign to save the wild. Gerstein’s illustrations are full of movement that mirrors the exuberant, boyish fun the two men have on their adventure. Amelia And Eleanor Go For A Ride. It would be hard to discuss the years of FDR without mentioning his formidable wife. I love this book which captures her adventurous, convention-defying spirit. In 1933, two convention-defying, risk-loving women sneak away from a stuffy dinner party and go for the ride in the sky! Brian Selznick’s black and white pencil illustrations capture the era perfectly. NOTE: I had really hoped to find more president books for kids about post-WWII presidents. Sadly, there are precious few. Kennedy Through the Lens: How Photography and Television Revealed and Shaped an Extraordinary Leader. This is a text heavy book that is geared for middle school kids and up but I found it fascinating and my kids enjoyed looking at the photos and we used them to discuss Kennedy’s legacy as a President and the big role the visual media plays in current presidential life. My astute 10 year old drew parallels between JFK’s children and the Obama girls. It’s also a gorgeous book. Sandler has another book, Lincoln Through the Lens: How Photography Revealed and Shaped an Extraordinary Life, which is probably just as good, and I look forward to reading it. Barack Obama: Son of Promise, Child of Hope. I actually think this book is a little heavy handed, but I liked the framework acclaimed poet Nikki Grimes set up with a mother and son watching Obama on the television, and the mother then telling the story of Obama’s youth. The story focuses on Obama’s childhood experiences in Hawaii, Indonesia, his relationship with his father and his search for a way to try and bring people together. A great talking point with your kids after reading this book would be how they view their own community, and what kind of leadership role they can take in it. I find the hate-filled vitriol that people spew about Obama or any other living president quite sad and I hope no parent teaches their children to speak that way, no matter what their political affiliation. I actually think it’s better to help children learn how to form their own informed opinions rather than simply tell them what to believe. Yo Millard Fillmore! : (And all those other Presidents you don’t know) is not actually a picture book, yet my older son did enjoy looking through it even though he describes himself as “not that into history” (something I am determined to change!). Lots of random facts about each man and a clever way for remembering everyone’s names keeps kids interested. Rutherford B., Who Was He? : Poems About Our Presidents. This look at the presidents through poetry is a fun addition to your President’s Day reading. I don’t really recommend reading them all at once; it can be a bit overwhelming, but use the book as a supplement or read a few poems each day. Since we incorporate poetry in our daily life, this was a fun book for us. An author’s note includes a very brief biography of each man. So what’s your take on presidential biographies for kids? 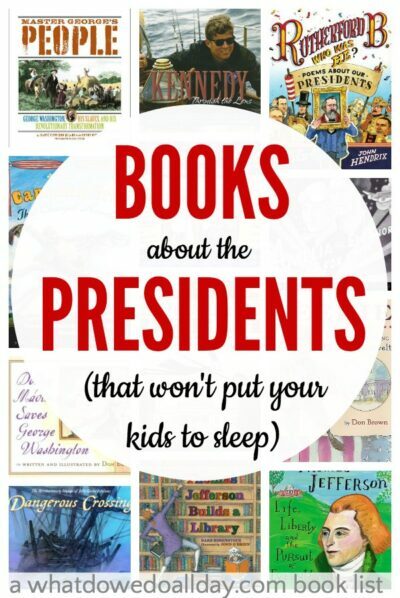 Do you have any president books for kids that you find interesting? I really liked Those Rebels John & Tom, by Barbara Kerley, and I love the illustrations by Edwin Fotheringham. It’s told in a fun, engaging way. I’m a big fan of many of her other PBs with him too, especially A Home for Mr. Emerson. That’s one of my favorites! I love Amelia and Eleanor Go for a Ride and have written about it. I also loved A Home for Mr. Emerson, the :about the author/illustrator” bit reminded me that they have done a book about Teddy Roosevelt’s daughter Alice which is a lot of fun. Also, there is no reason not to disagree publicly with the critics about books. So, ‘fess up – which ones don’t you like?!? Great list, Erica! I just reserved a whole bunch for my history-loving kindergartner and second grader. Oh, good! I’m glad it was helpful. My kids loved that one when they were younger. I love the title of this post! I too am super picky about biographies and admit that I tend to find many boring. And unfortunately, I have passed on my feelings to my girls so they are incredibly hard to please in the biography department. We’ll have to give these a try! I’m willing to guess that picture book biographies are extra difficult to write. So much info that authors have to distill in one book. It’s no surprise so many of them are a wee bit dull. Wow, such a wonderful variety of books, here. One of my recent faves is President Taft is Stuck in the Bath for a totally different presidential perspective. I also like: Our Presidents Rock! and Kid Presidents: True Tales of Childhood from America’s Presidents. What a great list! May I suggest a few more books? A fellow author and I both have written middle grade books about US presidents with themed activities published by Chicago Review Press. I love this list! my two favourite books about this topic are the kid who ran for president adn the kid who became president!